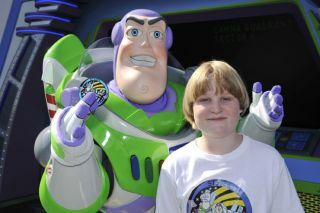 Buzz Lightyear at Disney World in Florida poses with Adam Carr, 11, and the patch that Carr designed for the space ranger's real trip into space. Copyright 2010 collectSPACE.com. All rights reserved.